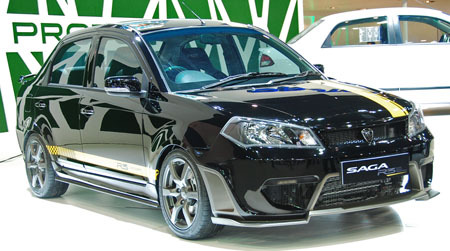 At the launch of the facelifted Proton Saga at the 2010 Thailand Motor Expo yesterday, Proton also showed off an R3 kitted variant on the stands. We have no information on this sporty Saga and presume that it’s a styling concept, although there’s nothing too outlandish here to rule out a production version. Show enough interest and perhaps Proton might listen! 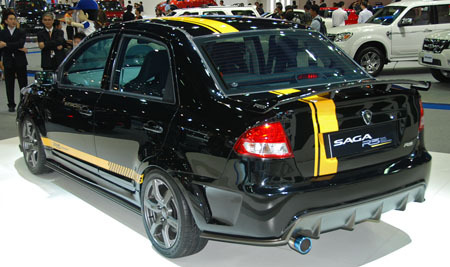 It’s in black with a distinctive single yellow racing stripe aligned to the left side of the car. This is matched by side stripes with the words ‘R3 Concept’ and a chequered flag pattern. The bronze R3 six-spoke alloys are in matching colour with the lower half of the aggressive front bumper (with side vents and big air intakes that just long an intercooler!) and the diffuser style rear bumper. There’s a rear spoiler and the exhaust also has a burnt tip look. I got ushered off the stage before managing to take pics of the cabin (the car was locked anyway), but there are Recaro buckets and a small diameter sports steering wheel. Next Post: 2011 Mazda5 MPV now available in Malaysia – RM150k!